Hello to you and a very merry Christmas! I'm sure that it was summer five minutes ago so I'm not coping well with the fact that in two days, 2014 will be gone forever. It's been a great year in many ways, and as we all know the best way to look back is by looking back at books! This is a linkup hosted by Jamie @ The Perpetual Page-Turner, the existence of which I found via Cait @ Paper Fury. It contains many delicious questions which I shall address hencewith! 50. 50/50 for my Goodreads challenge. ~ Harry Potter numbers 2-7 (I read them last Christmas holidays, so the first one was technically still in 2013 and therefore does not count). ~ Coram Boy by Jamila Gavin. I love that book. ~ The Hobbit by JRR Tolkien. 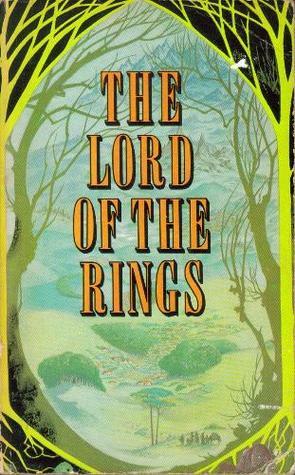 I read it years ago but reread it as a prequel to LotR, at a friend's insistence. ~ I also read Anne of Green Gables numbers 1-3, which I'd had read to me when I was younger, but that doesn't really count does it? Classics, which, according to the beautiful pie chart I made but am unable to upload (curse, you internet), made up 28.3% of my reading. That, you know, is a horrible question. I can't. And I won't. 12 books. One for each month, right?? Oh, and Harry Potter of course, but those were rereads. They'd blow everything else out of the water. This book wasn't bad, but I had such high hopes after How I Live Now (one of my favourite books of ever) and it really failed to meet them. Full review here. This book was totally and not at all what I was expecting. But I loved it! Review here. I almost put this as my answer to Q2 because I was really excited about it. I feel terrible for saying this, but what surprised me most was how bad the writing was. It seemed like Paolini had no editor and no concept of the beauty of sparse adverbs. Review here. I'm not sure, but I just read this post from Marian @ Ivory Clouds who says she wants to read Anne of Green Gables and Department 19 based on my recommendation ... others have said the same thing about Anne, too. Tell me: are there any books I've made you want to read? I am 100% head over heels in love with this series. I'm reading the third one right now. Its scope is spectacular; stunning plot; very well written; superb characters; a breadth of imagination that is close to unrivalled in everything I've read. 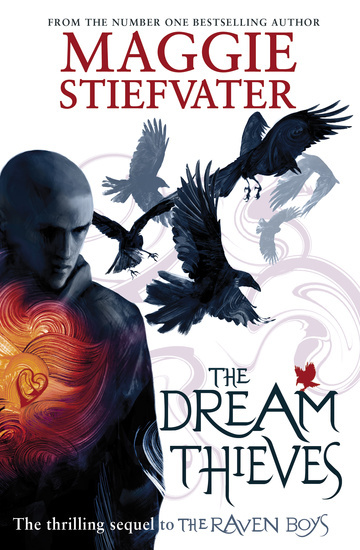 Best sequel goes to The Dream Thieves, which was beautiful and nerve-racking and fantastic. Review here. I must also mention Department 19: Zero Hour; I was going to give it joint place for this question, but I'm going to talk about it further down. Best series ender. Wow. OK. Skulduggery. Words. Words ... no words. Review here. I don't typically read guides to grammar (you could say: I've never read one before and I doubt I will do again), but this was highly enjoyable! Review here. ~heavy breathing~ I am a little obsessed with this series and this fourth book was the most high-powered pageturner yet. Wow, wow, wow. Review coming soon. 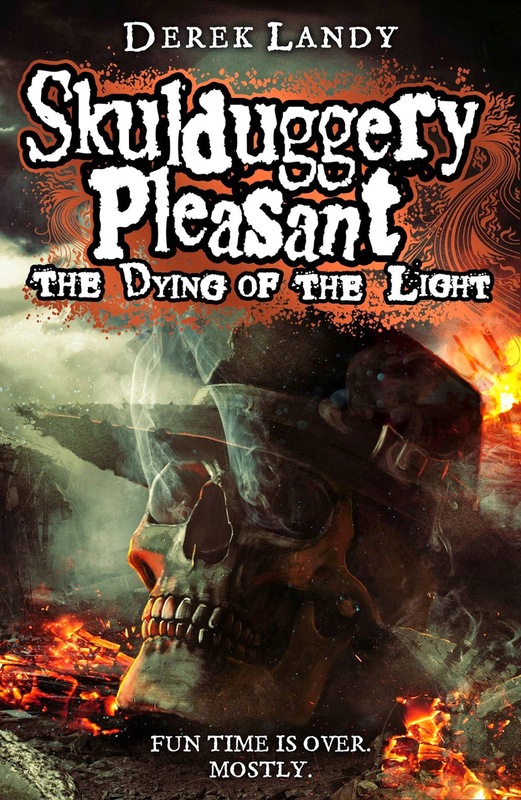 Also Skulduggery book 9. I'm trying not to answer every question with Skulduggery Pleasant though. Frankly? None. I reread a lot, but never the same book twice in two years. Skulduggery. Obviously. And Anne Shirley. They're pretty much my two favourite characters, male and female. Without a doubt. 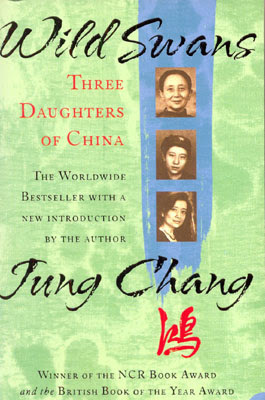 This memoir showed me Mao's China when I'd had no idea of it before and affected me very deeply. I think this should be mandatory reading for everyone. Full review here. How did a self-proclaimed fantasy fan go so long without this book? How did I not see the gaping Lord of the Rings shaped hole in my life? I absolutely loved it. That is all. The only rub was, Blue was another troubling thing. She was like Gansey in that she wanted him to explain himself. What do you want, Adam? What do you need, Adam? Want and need were words that got eaten smaller and smaller: freedom, autonomy, a perennial bank balance, a stainless-steel condo in a dustless city, a silky black car, to make out with Blue, eight hours of sleep, a mobile phone, a bed, to kiss Blue just once, a blister-less heel, bacon for breakfast, to hold Blue's hand, one hour of sleep, toilet paper, deodorant, a soda, a minute to close his eyes. Counting the three books as one, this was over 1000 pages. "I'm trying not to answer every question with Skulduggery Pleasant" -- hmm clearly not. 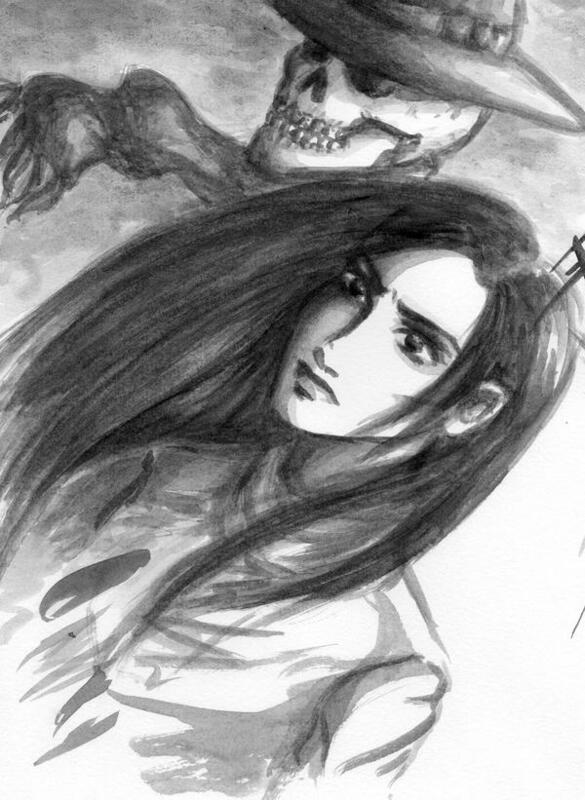 Skulduggery and Valkyrie (mainly Skulduggery. Let's not lie here. He is my absolute fave). Honourable mentions must go also to Jamie and Matt from Department 19; Anne and Diana from Anne of Green Gables; and the Raven Boys. 20. Favorite book you read in 2014 from an author you've read previously? 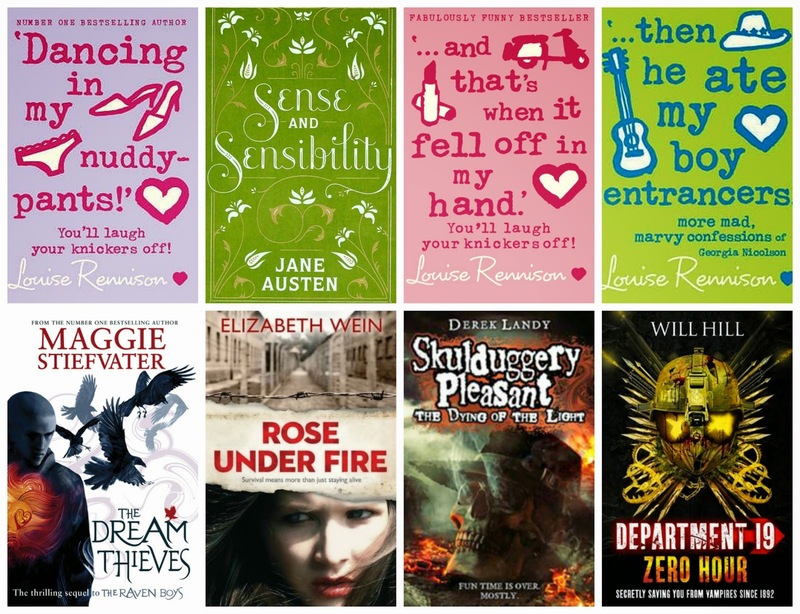 Previously read: Georgia Nicolson books 1-3 by Louise Rennison; Pride and Prejudice and Emma by Jane Austen; The Raven Boys by Maggie Stiefvater; Code Name Verity by Elizabeth Wein; Skulduggery Pleasant books 1-8 by Derek Landy; Deparment 19 books 1-3 by Will Hill. I read this solely because Kirthi Rao said I had to (and fangirled, often, in all caps, about it). Gilbert Blythe from the Anne of Green Gables series, and Valentin Rusmanov from Department 19. These two are polar opposites. I didn't. 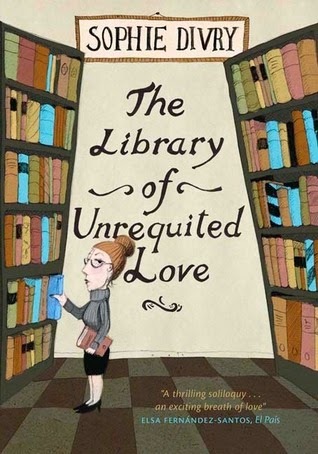 My TBR list is so long that by the time I get to things they're rarely debuts anymore! The scope of GRRM's world is absolutely stunning. He's created a heap of countries, all with their own customs and cultures. The maps at the beginning of the books are amazing. The depth of religion and tradition seems so real. I am bowled over. Always make me laugh out loud. These are numbers 4-6, the 3 I read this year. I adored this book. I seriously did. It was beautiful and compelling. Review here. Less mad than just hopelessly confused by my feelings. And stressed. And paranoid. And overwhelmed. And exhausted. How've I not got round to this yet?? I'm about to start it this very night (and yes, I know it's still 2014. Shoot me). 2. 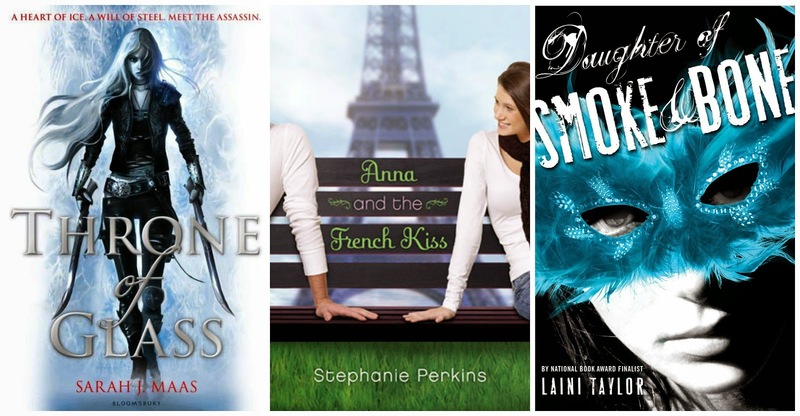 Book you are most anticipating for 2015 (non-debut)? // 3. 2015 debut you are most anticipating? I'm not sure ... I literally never have any idea what books are coming out. Especially debuts. Department 19 book 5!!! It's called Darkest Night, and it's coming out in June. I'm excited already. I am going to participate in the Goodreads challenge again, and once again I will set my goal as 50 books (the exact number I read in 2014). Nope. I'm not loved enough to be sent ARCs. 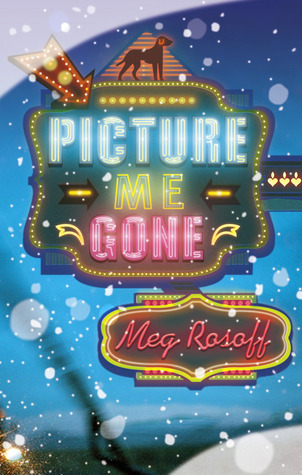 (Hint to publishers: send me ARCs!) Though actually I'm not sure if I'd want to. It would be reading to a deadline all the time. And what if they weren't good?? So, that is that! A very long post. A lot of questions. If you soldiered through it, I salute you. Now, let's play a fun round of you-answer-the-questions-I-give-you-in-the-comments, shall we? 1. 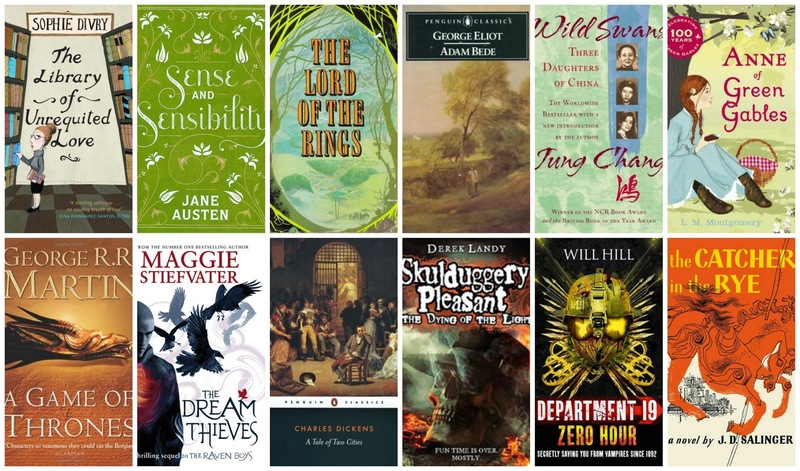 Best books you read in 2014? 7. 2015 release you're most excited for? 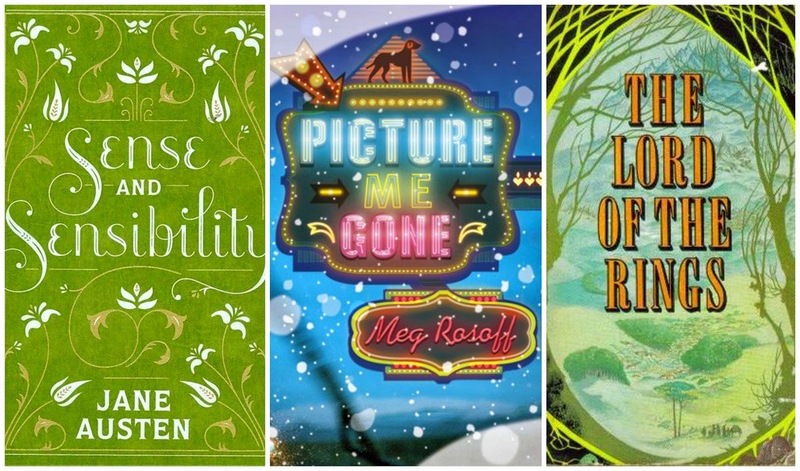 And if you've participated in this link-up, or any kind of 2014-book-wrap-up, do tell! And link me up! For now, a very Happy New Year. 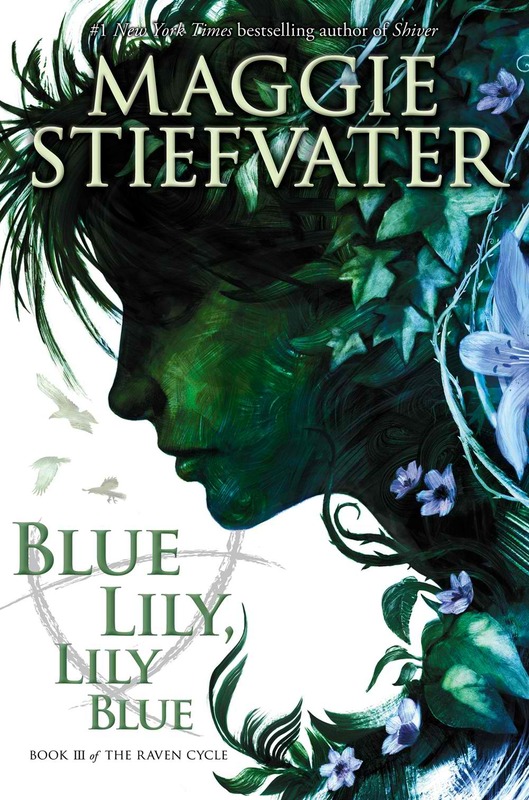 I'm off to read Blue Lily, Lily Blue! 1. WHY WOULD YOU DO THIS TO ME. Umm... 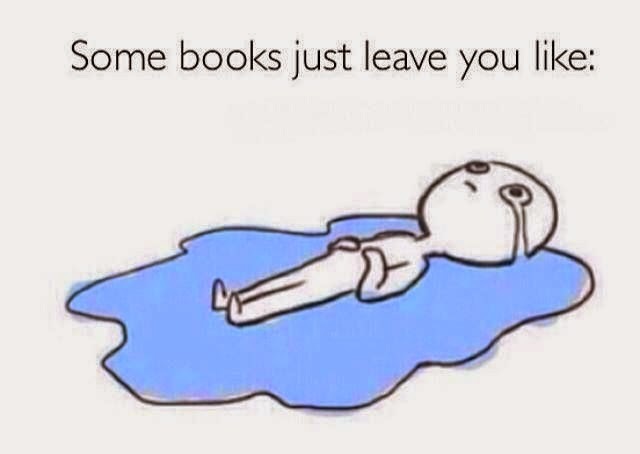 The Lunar Chronicles, The Heist Society Series, The Fault in Our Stars, and I'll Give You the Sun. 2. Definitely the Heist Society series. 3. Jude, from I'll Give You the Sun. 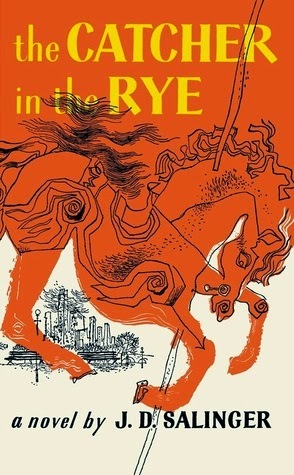 I read this book a couple days ago, and I still can't forget Jude's character (when she's 16). 4. Uhh... like 0-2? I hardly reread stuff. 5. Inland by Kat Rosenfield. Beautiful stuff. 6. The Fault in Our Stars. Made me think a lot. 7. Fairest by Marissa Meyer!! Eep!! 1. Ooh, I'll Give You the Sun. I've heard v. good things about Jandy Nelson (Nielson?). What's she called again? 2. Ally Carter? I really liked the Gallagher Girls series but I've not read Heist Society. 4. Personally I quite like a reread but I know some people don't. 5. I'll look it up. 1. Okay quite a few, to be honest. The Mistborn trilogy (have you read it? 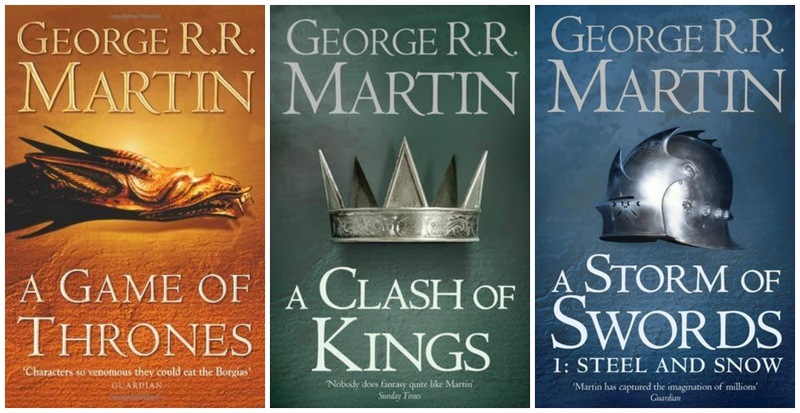 As a fantasy fan, I think you'd adore the series), A Game of Thrones (for all the reasons you mentioned), Deathless, Northanger Abbey, The Handmaid's Tale, A Room With a View, We Are All Complete Beside Ourselves, The Goldfinch, Burial Rites, Life After Life & How to be a Heroine (you'd LOVE this one). 2. The Miniaturist's cover is gorrrrgeous. 3. Kelsier from Mistborn… or Agnes from Burial Rites. It's a really good read! 2. I just looked it up and so it does! I'm a bit obsessed with dollshouses not gonna lie. 5. Ooh, Laini Taylor. Need to get that series read. 6. What is The Marriage Plot? I have loved digging through the link-up thing for this survey, reading everyone's responses. 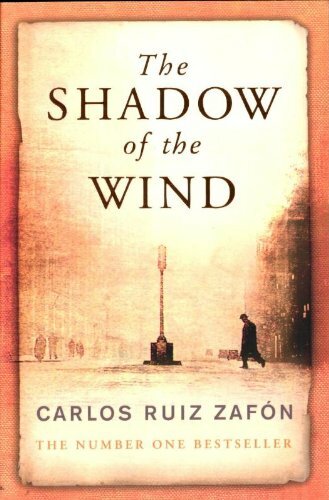 And yours is the second post I've read today recommending The Shadow of the Wind! So I guess that's def going on my TBR list. Happy New Year! It didn't, no worries! I am no stranger to comment-widget-difficulties. Just internet difficulty in general! It's 2015 (scary) and yet the internet still does not answer my every whim. I'm not OK with this. I'm hoping to get to Throne of Glass in 2015, too. I feel like everyone's read it but me... and I'm worried I'm going to hit some spoilers if I don't read it soon! You must read Daughter of Smoke & Bone! It's pretty amazing. The second two books in the series kind of dominated my survey this year. And I love that cover of Sense and Sensibility! So pretty. I feel like that too! I fortunately have avoided spoilers until now but I guess I should get to it as soon as possible and take away the risk! I'm so excited! It sounds sooo good. 2. Favourite Cover..... hmmm..... well besides the Sense and Sensibility (I think I'm in love), I think Fangirl was lovely. 5. Most beautifully written would have to be The Goldfinch by Donna Tartt. Not finished though yet. 7. Erm... I don't really follow any trend and am not sure what will be coming out. I just read reviews on blogs and be like "ooh that looks good!" I know! <3 I have the same editions of Pride & Prejudice (which is blue) and Persuasion (which is pink). I like to see them lined up on my shelf, looking shiny! 5. I WANT TO READ THAT!! After Ruby's posts I really need some Donna Tartt! 7. Same! I only know about series I'm following, which currently (after the end of Skulduggery ~shaky breath~) is only one, Department 19. I do not know how people find out about debuts! YOU ARE NOT ALONE. Well, they are all preeeetty good! 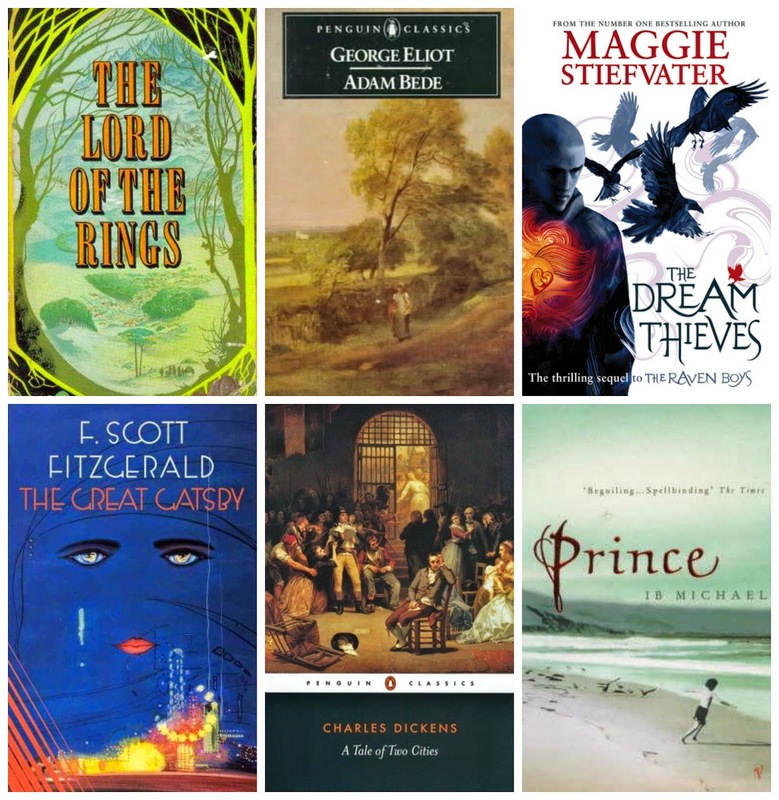 I'm trying to slyly infiltrate the YA blogosphere with classics (sshh, don't tell anyone). RAVEN BOYS! YOU MUST! I finished Blue Lily, Lily Blue this week. ~does the fangirl melt~ I'm v excited for those three books/series ... I am sure I will love them! You sure read a lot! Seriously, fifty books is quite an accomplishment. 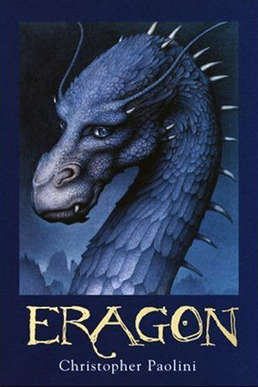 I actually haven't read a lot of the books you posted about *shudders in embarrassment* and I know I probably should.... One of the few I read that you read was Eragon. 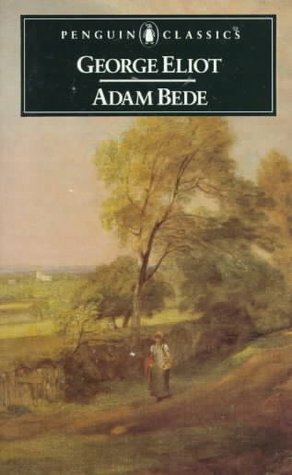 I've actually read this twice, once when I was a wee young thing and I loved it, and once when I was maybe 13 (so three-ish years ago) and I hated it. I felt as if the author tried to put too many unrelated things into one book. So not my favorite either. You NEED to read Mistborn. It's probably my favorite book. Also, if you want to you could read The Knife of Never Letting Go (first book in Chaos Walking series) which is also one of my favorites. How long did this post take you to write?? It's so long and you included so many pictures!! 1. MISTBORN! Between you and Ruby (Feed Me Books Now) I am absolutely desperate for this series. Also Wolves of Mercy Falls. As this post makes very clear I'm a bit obsessed with the Raven Cycle so I need more Maggie Stiefvater in my life! I have Shiver and Linger, actually, bought secondhand, as well as Lament. I am excited. 2. I do love that cover. 5. Interesting, I've not read that one. 6. Never actually read any Keller though I know I should. I've heard of This Star Won't Go Out, it's on my sort of not-urgent-TBR-ish-list. 7. Not read those books either. Worth it? I KNOW!!! Gllllaaahhh favourite book really? Amazing! I've read one Patrick Ness (A Monster Calls) which I really liked. I know a lot of people love Chaos Walking. I'll probably have to give it a go. In all seriousness I really like your blog. New follower! 1. MAGGIE! Yes yes yes. I have Shiver and Linger and am very excited to read them. Have you read The Raven Boys? 2. It is beautiful I agree. 3. Really want to read! 4. Yes I see, haha! I'm so excited for it, you're hyping me up! 5. SHIVERRRR I'm practically fangirling myself here from this comment!! 6. I WANT TO READ SHIVER! 7. Haha well Raven Cycle #4 is coming out so you can read the first three books and get excited for that instead! Thanks so much! Sorry for this horribly late reply, I have been without internet for 1 month but it is finally back and I am able to reply to comments again.